One would think there would be just as many poetry anthologies about food as there are about love. After all, as human beings we need and crave both, and what better way to nourish our minds, hearts and souls than with a delectable volume of verse devoted to celebrating and exploring the role food plays in our lives? Today’s menu features ten favorites I pulled from my shelves. Whenever you’re hungry for a little smackerel of something — dip, sip, savor, nibble and nosh on the poems found in these toothsome culinary collections. 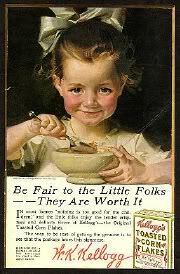 They’ll surely satisfy your cravings (several also contain recipes). 🙂 If you know of any others, please share in the comments. Enjoy! 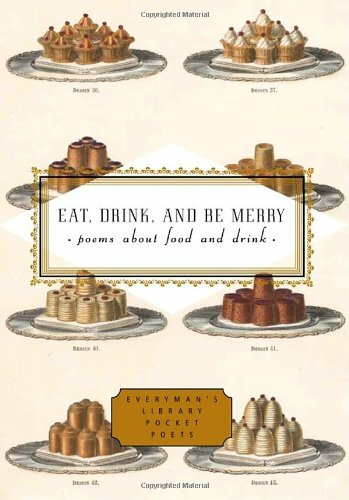 Eat, Drink, and Be Merry: Poems about Food and Drink, selected by Peter Washington (Everyman’s Library Pocket Poets/Knopf, 2003). All kinds of foods and beverages are laid out in these pages, along with picnics and banquets, intimate suppers and quiet dinners, noisy parties and public celebrations–in poems by Horace, Catullus, Hafiz, Rumi, Rilke, Moore, Nabokov, Updike, Mandelstam, Stevens, and many others. From Sylvia Plath’s ecstatic vision of juice-laden berries in “Blackberrying” to D. H. Lawrence’s lush celebration of “Figs,” from the civilized comfort of Noël Coward’s “Something on a Tray” to the salacious provocation of Swift’s “Oysters,” from Li Po on “Drinking Alone” to Baudelaire on “The Soul of the Wine,” and from Emily Dickinson’s “Forbidden Fruit” to Elizabeth Bishop’s “A Miracle for Breakfast,” Eat, Drink, and Be Merry serves up a tantalizing and variegated literary feast. A charming tasting table, with poets classic to modern, famous and not so famous. There is an emphasis on light verse, a welcome treat for the literary palate, served up in eight “courses”: Plain Food, Square Meals, Fruit, Vegetables, Delicatessen, The Food of Love, Feasting and Fasting, and Liquor is Quicker. 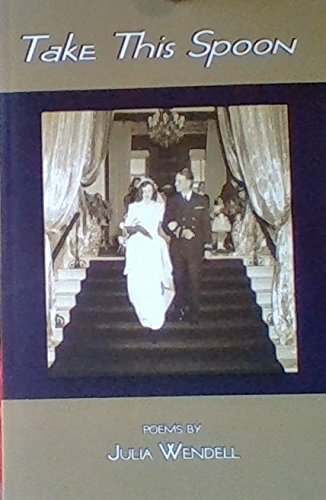 About 140 delectable poems. or asks us for an interview. it cries out, I’m yours. Whatever is you, is pure. 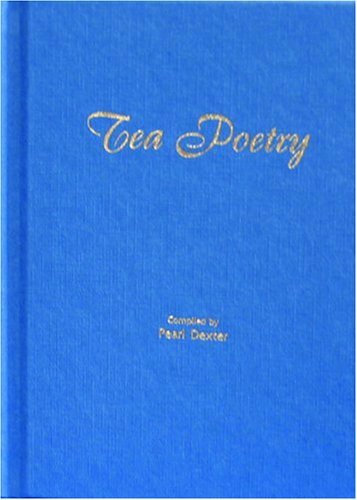 Tea Poetry, compiled by Pearl Dexter (Olde English Tea Company, Inc., 2003). This is a handsome gift book for tea aficionados featuring 60 poems spanning centuries, from the Chinese Jin Dynasty (265-420 A.D.) to the 21st century. There’s a mix of serious, humorous, and whimsical poems perfect for reflection and contemplation. It includes poets such as Emerson, Eliot, Brooke, Basho and Issa, but the majority of poets were new to me. The verses are presented on creamy parchment paper with gold and dark blue borders, blue font, gold calligraphy and filigree accents. 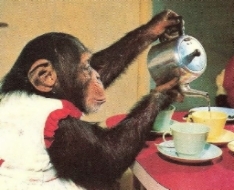 Pearl Dexter founded Tea A Magazine (now The Daily Tea), to educate the public about tea culture. 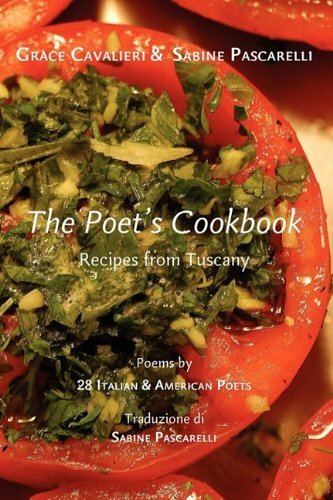 The Poet’s Cookbook: Recipes from Tuscany, Poems by 28 Italian & American Poets, edited by Grace Cavalieri and Sabine Pascarelli (Bordighera Press, 2009). A mouthwatering collection of totally doable Tuscan recipes and delectable poems presented in both English and Italian by such poets as Linda Pastan, Diane Lockward, Michael S. Glaser, Judy Neri, and Vivian Shipley. Writing and cooking friends Grace Cavalieri (Annapolis, Maryland) and Sabine Pascarelli (Tuscany) share recipes that were once purely Italian and are now becoming Italo-American. They’re both authors and poets (you may know Grace as the radio host of “The Poet and the Poem” from the Library of Congress), who share a common culinary heritage and treasure the sense of community that cooking naturally affords. 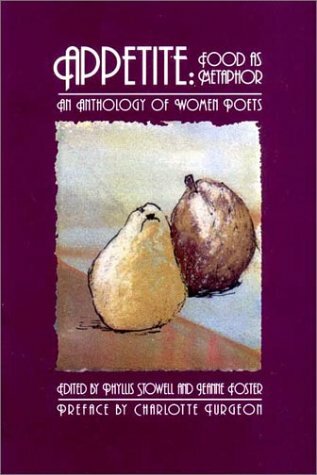 Appetite: Food as Metaphor (An Anthology of Women Poets), edited by Phyllis Stowell and Jeanne Foster (BOA Editions, 2002). In poems from as varied women poets as Jane Kenyon, Lucille Clifton, and Anne Sexton, food emerges as a re-occurring and central metaphor in the way women live, in the pulse of the everyday, and as a vehicle for the exotic. From coffee to caviar, from potatoes to dandelions—even in hunger and anorexia—the metaphors of food have worked like yeast in the imagination of these poets. As these women speak of their intimate relationships with food, expressing their joy, rage, and yearnings, we see how food can be an incisive lens for viewing life’s imperatives. 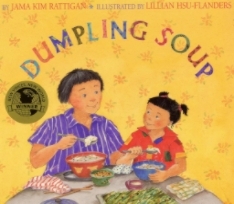 Favorites: “Bite into the Onion” by Marge Piercy, “On Stopping Late in the Afternoon for Steamed Dumplings,” by Toi Derricotte, “How to Stuff a Pepper,” by Nancy Willard, and “All the Soups” by Martha Rhodes. 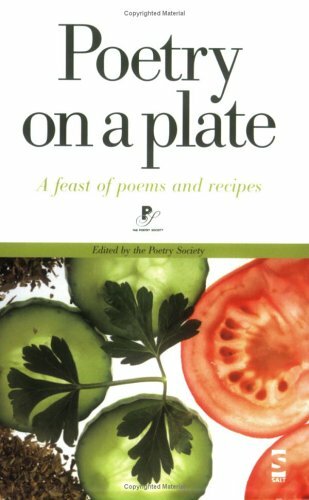 Poetry on a Plate: A Feast of Poems and Recipes, edited by the Poetry Society (Salt Publishing, 2004). 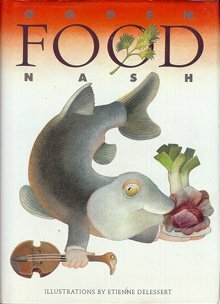 This is a unique collection of poems, recipes and food musings by top UK poets, chefs and food writers, published in conjunction with National Poetry Day 2004, which was devoted to celebrating the theme of Food. It was interesting and enlightening to explore the creative impulses that chefs and poets share — how both bring their levels of skill, life experiences, memories, and instincts to create something original from scratch. The book begins with A Visit to the Poetry Café in Covent Garden, with recipes from café cooks as well as poets who’d been invited to cook and host dinners there. 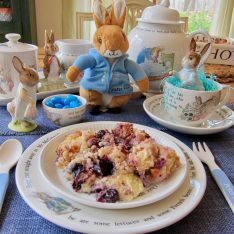 The bulk of the collection is devoted to poems and recipes grouped according to Appetisers, Mains and Sides, and Puddings, with a National Poetry Day Menu topping everything off. Though none of the poets were familiar to me, I certainly enjoyed discovering “new” ones like John Agard, Matthew Sweeney, Sarah Wardle, and Ian McMillan, and found myself intrigued with dishes such as Tagliatelle with Fig and Chilli, Badaam Kali Murg, and Valrhona Chocolate Pudding. 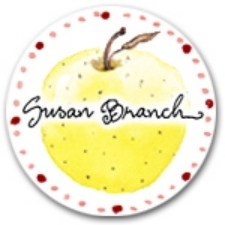 I’ve featured several of the poems on this blog before, including “Making Lemon Curd” by Robert Seatter and “Word Tasting” by Sarah Wardle. 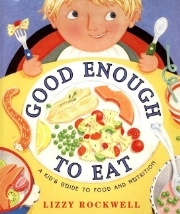 Food by Ogden Nash, illustrations by Etienne Delessert (Stewart, Tabori & Chang, 1998). If you’re an Ogden Nash fan, you’ll likely grin, giggle, and maybe even guffaw over the fetching smorgasbord of witty nuggets in this little book. Paired with Delessert’s clever, quirky duotone illustrations, these verses with verve are perfect for a sassy afternoon snack, a sly nip before dinner, or whenever you need a quick happy fix. No doubt you’re familiar with Nash’s “Candy is dandy/but liquor is quicker,” which is included here, along with other delightful bon mots and longer poems which make you wonder what the chef might have slipped into Mr. Nash’s bouillabaisse. That tripped and popped under. 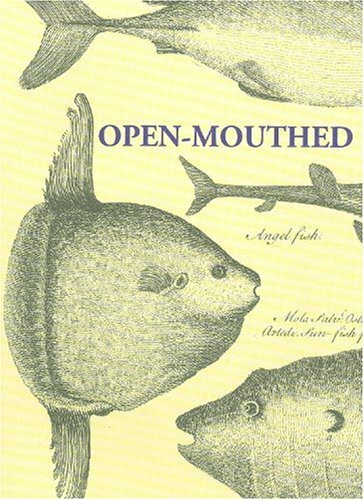 Open-Mouthed: Poems on Food by James Crowden, Lawrence Sail, Alan Peacock, and Elisabeth Rowe (Prospect Books, 2006). This little book contains a surprising 64 poems by four Devon poets, and was initially published to help fund a bursary scheme enabling young students to attend the Dartington ‘Ways with Words’ literary festival. The poems are probably best appreciated by Anglophiles, especially those interested in the culinary culture of the region, or by those who enjoy flavors of faraway places. I did enjoy “meeting” these four poets within the pages of this book since their frames of reference are so different from mine and I did learn a lot. Though most of the poems touch upon universal themes, they might have had more impact on first reading if I had been more familiar with certain place names, etc. Favorites: “Ode to a Cornish Pasty” by James Crowden, “Capiscum Rap” by Alan Peacock, “Devon Cream Tea” by James Crowden. In Open-Mouthed, the reader can find a rich à la carte menu of poems, some al dente, others al fresco, succulent morsels plucked from hedgerows and kitchens at home and abroad . . . So here you will find, or instance, Cornish earlies alongside borscht, pistachios and mussels, wild mushrooms mixing with a hostess trolley, artichokes and alphabet soups, tripe an’ cow ‘eels, sad cake and sloes, trout hatcheries, mushy peas, mammoths and the Meat Commission: dishes to suit all tastes. I could eat you all up. 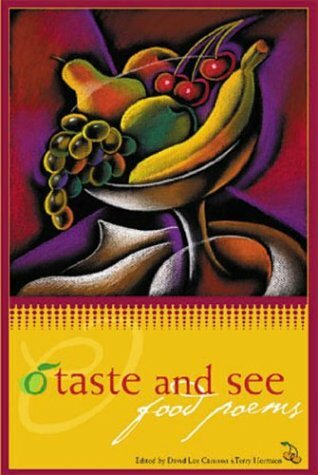 O Taste and See: Food Poems, edited by David Lee Garrison and Terry Hermesen (Bottom Dog Press, 2003). 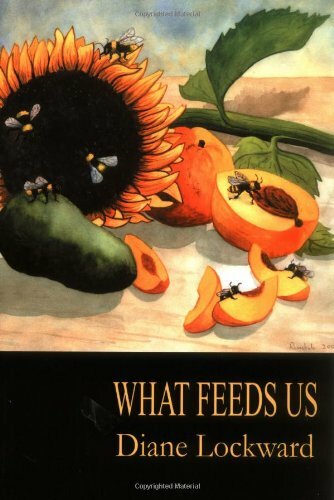 This collection contains 200 pages of food poems by about 100 of America’s finest modern poets (Denise Levertov, Elizabeth Bishop, Robert Frost, Frank O’Hara, William Carlos Williams, Charles Simic, Billy Collins, Rita Dove, Susan Rich, Diane Wakoski, Joyce Sutphen, Wendell Berry) and is sure to please a wide variety of palates and appetites. Poems are grouped in nine sections: Friends, Recipes, Family, Garden, Stories, Odes, Love, Market, World. In these poems food tells us about our heritage, who we are, about love, our rituals, about giving and gorging, it tells us of the sweetness and abundance of life, what might have been, that reading can make us hungry. 🙂 Ultimately it tells us that “we need poetry as much as we need food.” Favorites: “Kitchen Logistics” by Lois Beebe Hayna, “Reading the Menu” by Natasha Sajé, “For My Friends, Who Complain That I Never Write Anything Happy” by William Greenway. Not too long ago I featured Jeff Gundy’s “Cookie Poem,” which is included in this book. 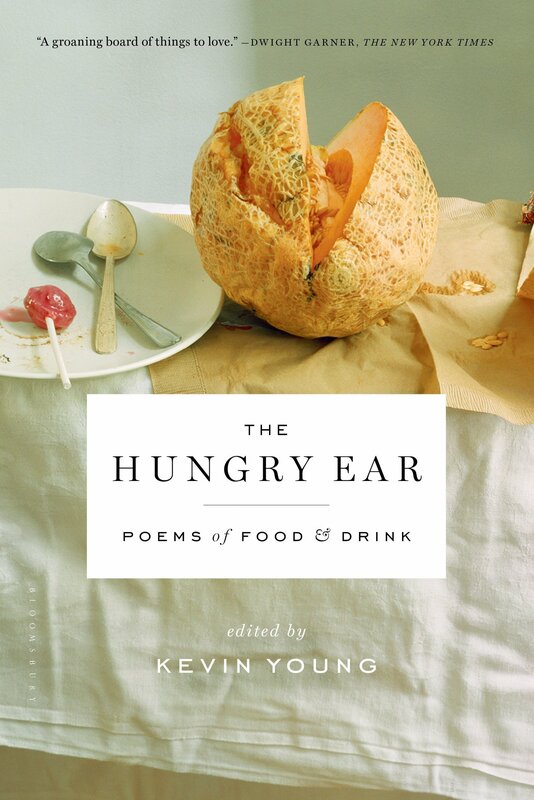 The Hungry Ear: Poems of Food and Drink, edited by Kevin Young (Bloomsbury USA, 2012). Food and poetry: in so many ways, a natural pairing, from prayers over bread to street vendor songs. Poetry is said to feed the soul, each poem a delicious morsel. 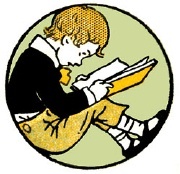 When read aloud, the best poems provide a particular joy for the mouth. Poems about food make these satisfactions explicit and complete. Of course, pages can and have been filled about food’s elemental pleasures. And we all know food is more than food: it’s identity and culture. 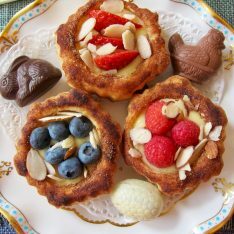 Our days are marked by meals; our seasons are marked by celebrations. We plant in spring; harvest in fall. We labor over hot stoves; we treat ourselves to special meals out. Food is nurture; it’s comfort; it’s reward. While some of the poems here are explicitly about the food itself: the blackberries, the butter, the barbecue–all are evocative of the experience of eating. Many of the poems are also about the everything else that accompanies food: the memories, the company, even the politics. Kevin Young, distinguished poet, editor of this year’s Best American Poetry, uses the lens of food – and his impeccable taste – to bring us some of the best poems, classic and current, period. If I had to choose just one food poetry anthology for a permanent place on my shelves, I would go with The Hungry Ear. I return to this soul nourishing 158-poem collection again and again; no matter the time of year, emotional need, or specific hunger, I always find something that hits the spot. 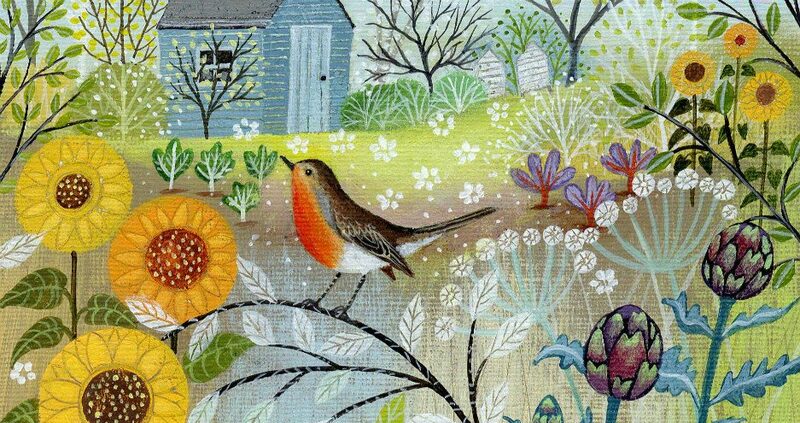 Poems are grouped seasonally from the Harvest Moon’s First Harvest, to Wintering’s Soup Lines & Staples, to Spring Rain’s Pig Out, and finally to Sweet Summer’s Short Orders and Forbidden Fruit. Wonderful epigraphs whet the appetite for each section and sub-section, there’s a stellar roster of top-notch international poets (Mary Oliver, Theodore Roethke, Mark Strand, Rumi, Charles Baudelaire, Langston Hughes, Seamus Heaney, Pablo Neruda), and the poems themselves “honor food’s unique yet multifaceted pleasures,” show food’s healing power after loss, and the role it plays in celebrating an occasion or a season, in everyday and extraordinary ways. “Food too can be where we experience, or reclaim, culture . . . The table is literally where we experience the spice of life; and learn the names of spices in other tongues. Food is often our first adventure with another culture and a way we learn to measure our own.” Young has set a bountiful table featuring an omnivorous menu with a focus on “source foods” and “eating local.” Poems I’ve featured from this anthology include “A Short History of the Apple” by Dorianne Laux and “Butter” by Elizabeth Alexander. This gem was originally published in 1996, then re-issued with a new cover in 2002. 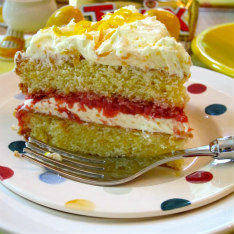 The majority of recipes are from the poets themselves and relate directly to some aspect of the poems. Truly a sensory feast enhancing both the reading and cooking experience, poem and recipe play off each other in an intimate way, deepening our appreciation of the poets’ social and cultural milieux. There’s also a nice mix of cuisines — Chinese, Japanese, Mexican, French, Italian, Mediterranean. 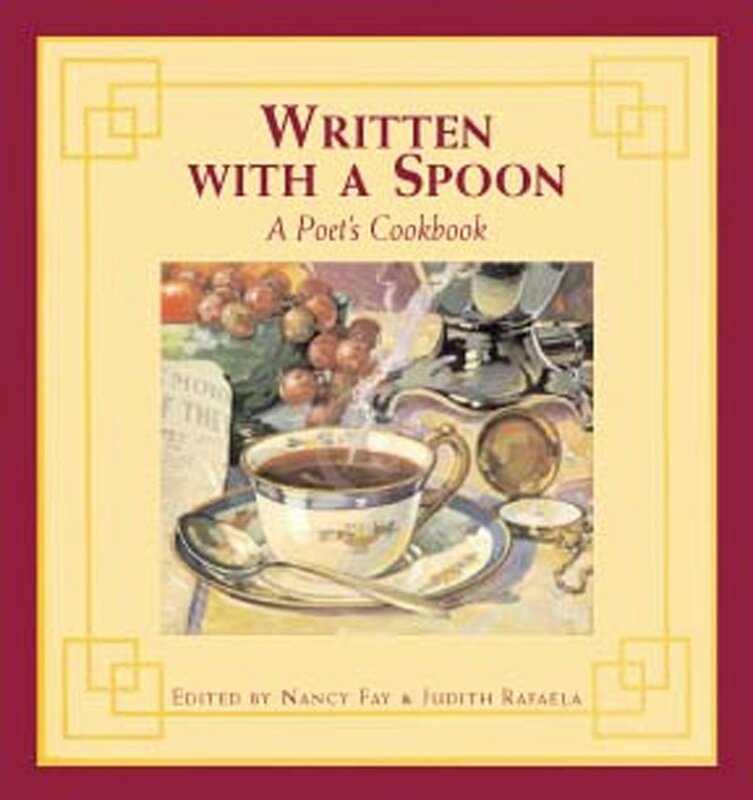 Poems and recipes are grouped by course (Appetizers, Soups, Pastas and Breads, Entrees, and Desserts), in addition to a section on Comfort Foods and Cafe Culture (poems without recipes). Favorites: “My Husband Looks Nothing Like Paul Prudhomme” by Stella Reed (Peter’s Seafood Gumbo), “Praise Song for Cilantro” by Susan McCarthy (Hot Meatloaf a las Carnitas), “A Simple Flan” by Deborah Casillas (Flan), “Grief is Like an Onion” by Katrina Barch (Breakup Beef Bourguignonne). COMING SOON: This one will be released on May 15, 2015, and I can’t wait to see it! Joys of the Table, edited by Sally Zakariya (Richer Resources, 2015). “The joys of the table belong equally to all ages, conditions, countries and times; they mix with all other pleasures, and remain the last to console us for their loss.” (Jean Anthelme Brillat-Savarin). Food is our common ground, a universal experience, wrote gastronomist and cookbook author James Beard. No matter the distance or language or years that divide us, eating is an experience we all share. Joys of the Table explores the many facets of our complex relationships with food, from our fondest kitchen memories to ways we express our love through food, from a child s hunger to a holiday celebration, from lighthearted menus to intimations of our final meals. Virginia poet Sally Zakariya has gathered almost 100 poems from 75 poets for this anthology. 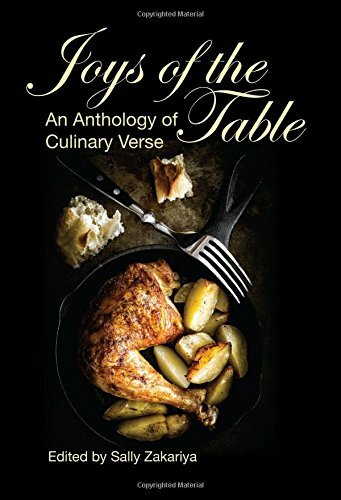 The result is a rich poetic feast, sprinkled with occasional recipes from the poets themselves, a delicious dish for food-lovers and verse-lovers alike. Not food poetry anthologies per se, but excellent single author collections that contain some wonderful food poems. I love the way these female poets write about food! 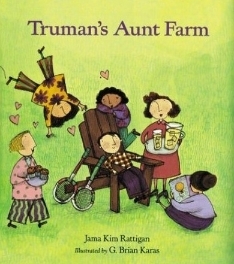 I previously featured “Blueberry” from this book. 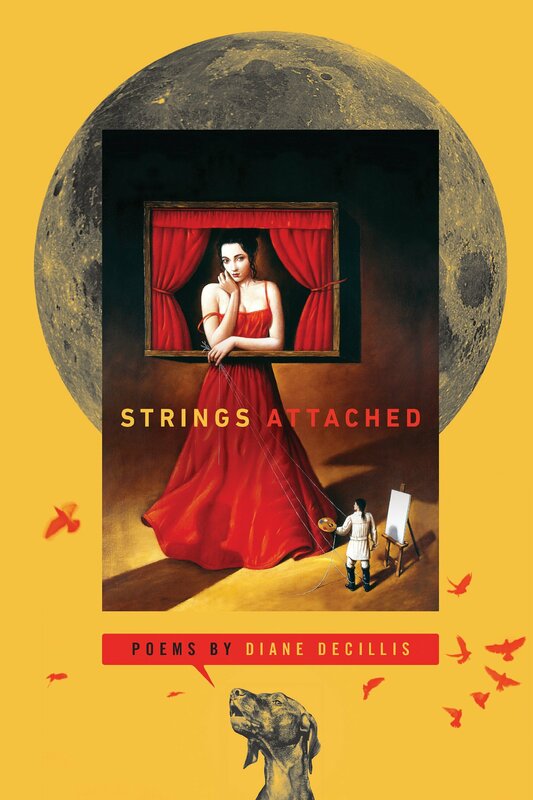 Strings Attached by Diane DeCillis (Wayne State University Press, 2014). In Strings Attached, poet Diane DeCillis takes inspiration from the story of the elephant calf with a thin rope tied to its leg. Even when it grows into a massive animal, the elephant thinks the same string still restrains it and never attempts to break free. This powerful, funny, and sometimes self-deprecating collection considers all the ways that strings bind us in relationships and explores their constant tightening and loosening. Although we may never sever the strings attached to our wounds, DeCillis shows that when given enough slack we can create the illusion of having been set free. My review of this title is here. 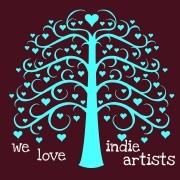 Click here for my review and chat with poet Julia Wendell. 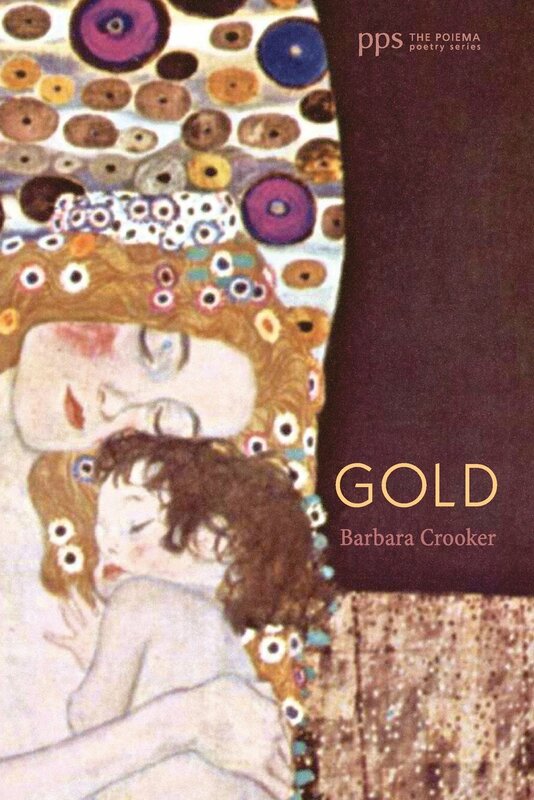 Gold by Barbara Crooker (Cascade Books, 2013). Barbara Crooker’s new book Gold focuses on one of the most profound life-altering experiences possible: losing one’s mother. This collection is an elegy, not just to the speaker’s mother, but to a lost Eden that cannot be reclaimed. 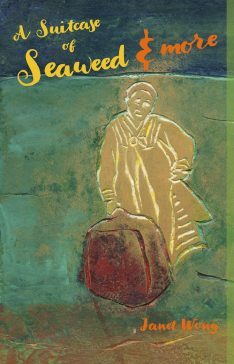 Beginning with a series of lyrics set in autumn, the poems become more narrative, recounting the long illness of Crooker’s mother, her death, and the profound journey along the shores of grief. Throughout, Crooker is aware of the complexity and strength of the mother/daughter relationship and the chasm that this loss opens. I featured “Peeps” from this book in September 2013. The beautiful, talented and witty Michelle Heidenrich Barnes is hosting the roundup at Today’s Little Ditty. 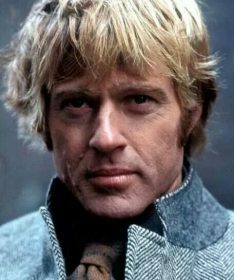 Mix a few metaphors, simmer a stanza or two, and enjoy the full menu of poetic goodness being served up in the blogosphere this week. Mangia, mangia! Didn’t know your Dad liked food poems, Michelle! He sounds like a keeper :)! what a mouth-watering array of books–yum! And am happy to see “Joys of the Table” in the group, in which a poem of mine appears. 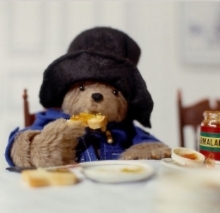 Thank you so much, Jama, for all you do for food and poetry (and bears and Colin! )…happy eating! Can’t wait to see your poem, Sharon! The poem from Open-Mouthed made me sigh and the Ogden Nash verses made me laugh out loud. Thanks for sharing this buffet of books! Jama, you tirelessly answer Neruda’s call to share poetry with our “vast, incredible, extraordinary family of humanity” – written by the same! I can imagine you savoring all these great books on your shelves, with the occasional drop of tea of fleck of flour on favorite pages. Thanks for sharing with your hungry readers! 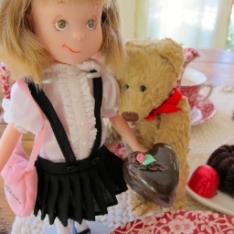 Smackerel came straight from Winnie the Pooh and Christopher Robin. 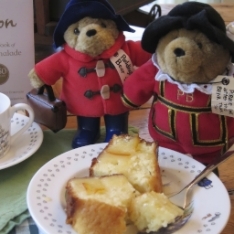 Hungry bears are always up for a little smackerel of something :). Appreciations Jama. For all the titles but I do love my Ogden Nash so that’s for the reference. Hadn’t heard of Sweets and Treats — will look for it! Barbara’s book touched so many chords. MD has become a different ball game altogether. Trying to focus on pleasant memories. Thanks for the kind thoughts, Jan. Thanks for your delicious selection of poetry and food books! I haven’t heard of most of these. I do have all of Young, Crooker, and Lockwoods books, and they are all fabulous. I can’t wait to buy many on your list today! There’s one you didn’t mention, Irrepressible Appetites, ED. Tracy Broussard, Rock Press 2002. It’s chock full of poems, recipes, and stories about food written by contemporary poets (including me). Thanks for the heads up! I’ll look for Irrepressible Appetites. Nothing better than digging into more food poems. 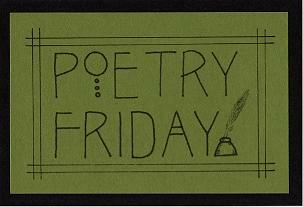 Looking forward to seeing your poem :). Wow! Who knew there were all these poetry anthologies about food? Thank you for introducing them to me. Gold just went on my to buy list. You will enjoy GOLD, I’m sure. Barbara never disappoints. They all sound great, but I have a ridiculous love for Ogden Nash’s doggerel. The Eat, Drink & Be Merry and O Taste and See sound fun, too. Thanks for a peek at your shelves! Wow what a poetry feast! Thanks so much for finding these, Jama. It took me almost 8 years to find just these 10. There really should be many more. Before our used book super-store lost their lease and shut down, I was able to pick up several “Everyman’s Library Pocket Poets” volumes really cheaply. I missed getting Eat, Drink, and Be Merry. I’ll be on the lookout for that one! Now I’m hungry for brunch and poetry. I will have to get a couple of these, none of which I have. What a high standard you are setting for food related poems. I may be too scared to try writing one now. Nah, let’s wing it! Now it’s gone, what a waste. Even if abstracting it was rude. LOL I’m a kid at heart. I love your posts. What a wonderful list! I have to admit that Ogden Nash is a favorite. He’s definitely one of a kind! You say, “If I had to pick one . . .” I immediately add it to my wish list. 🙂 Thanks! Thank you for sharing this delectable collection today, Jama! I feel like I’m at a sumptuous buffet and don’t know which treat to taste first. Oh, what a feast of poetry! I love the idea of being able to “dip, sip, savor, nibble and nosh on the poems ” in these collection, Jama, each of which looks more glorious than the next. What a fun collection! Makes one hungry…and thoughtful! Yes, a different kind of nourishment! I can’t believe there are so many choices of anthologies about food!! Though it’s no good for recipes, I have to say Ogden Nash’s book is the one I would buy – if only for “Parsley/Is Gharsley.” That’s so terrible it’s wonderful! Why don’t we think more about food poetry?!? These sound great. I will keep an eye out for The Hungry Ear. The Hungry Ear is a wonderful anthology. Kevin Young has exquisite taste :).